Maintaining a five-star performance for our customers highlights the commitment and skill of Bovis Homes staff. 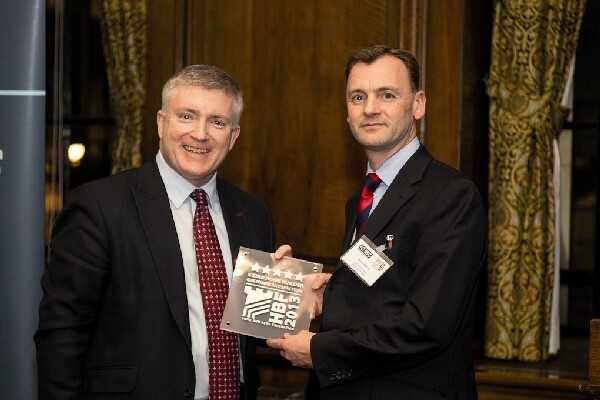 So says Chief Executive David Ritchie, who collected the Home Builders Federation's top customer satisfaction award from Housing Minister Mark Prisk at a special ceremony in Westminster recently. It is the second year running that Bovis Homes have won a five-star rating from our customers, based on their answers to the HBF survey asking about the overall quality of their home and the standard of after-care service received. "We all have an impact on customer satisfaction so this five-star rating is a tribute to everyone at Bovis Homes for their commitment to delivering high quality in their own areas of the business," said David. Stewart Baseley, Executive Chairman of HBF, said today: "These results clearly demonstrate that consumers are overwhelmingly happy with the service house builders are delivering. "The industry has often faced criticism over the last few years from misguided or ill-intentioned "experts", but the people who really matter - those who buy new homes - are giving us a clear thumbs up."